Alice* had first come to see me for weekly equine assisted therapy sessions as part of her intensive outpatient treatment at the eating disorders clinic I partner with. For 10 months, we had worked together battling through the demons that held her prisoner. For 10 months, she had painstakingly clawed her way back to a healthy weight, battled her desire to restrict calories and exercise excessively, and had begun to quiet the voices within her that told her she was not good enough. No longer at risk of needing residential care, she was deemed to be “in recovery.” Now, a year later, she was back in intensive outpatient treatment, struggling to make sense of her relapse into the destructive cycle of anorexia. She stood before me feeling defeated and angry with herself and the world, believing that no one cared enough to notice her struggles. She was convinced that once “out of sight, out of mind.” Her friends had all left for college and she didn’t want to be a nuisance to them so had distanced herself. Her previous therapist had left the clinic, and she felt abandoned and alone. Everything had changed and everyone else had moved on; even this herd of horses that she had grown familiar with had doubled in size with new members since we had last worked together. As she stood in the pasture talking about the futility of her existence, one by one they came, all six of the original herd members that she had worked with previously. One by one, they stood before her, sniffed, bowed their heads, and then stepped to one side to make room for the next. One by one, they greeted her and presented themselves to be available to work with her, connect with her, and be a shoulder to lean on for her. They stood in a circle facing her, waiting patiently. I asked her if she had noticed that all her old friends had come to greet her. She was convinced they were there to see me and their presence had nothing to do with her. Quietly, I stepped away from them all until I was about 20 feet away, trusting that the horses would stay with her. Her eyes shone with tears as she breathed in a new reality where she could begin to believe that she matters, that she has an impact on those around her, and that she is not alone. As an equine assisted therapist, I rely on the authenticity of my herd of horses to guide clients to a new awareness of their process. I’m often asked how the horses know what to do, or whether they are trained to behave in a certain way. I answer truthfully that I couldn’t train those horses to do that even if I wanted to, and that I never know what might happen in a session. In true existential tradition, I focus on the here-and-now process of how my client is relating to me and to the horses. 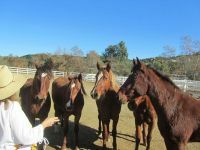 For their part, the horses are simply being horses; they attend to the immediacy of the moment and are available for connection if the client is open to it. If not, they’ll go about their business without judgment. For the horses, it’s simple. Horses are herd and prey animals, so it is in their interest to be relationally aware of each other at all times. When one moves, they all move. There is synchronization and coordination in their way of being with each other, knowing that their survival depends on being tuned in to each other. Their instinct to connect with humans who enter their herd is partly their survival mechanism of needing to know where they stand with regards to the newcomer. It is a bonus for us as humans that they are willing to stay connected once they figure this out. Students often embark on the journey towards becoming a therapist with an attitude of wanting to heal clients. This may stem from their own struggles in life, or having been clients themselves and having experienced the support of their own therapists, so then they want to help others. These are valid and honorable reasons to go into the profession; it was certainly true in part for my own journey. So we put our efforts into learning the theories and techniques, and attempt to present our best selves to our clients in the hope of getting through to them and making a difference. We sacrifice time with family and friends to study and complete internships and supervised clinical hours, and we work hard to achieve the competence required to be a good therapist. A decade on from beginning my journey, as I reflect on my motivation to do this work, I have come to realize what the horses have always known. The most meaningful therapy isn’t about techniques or knowledge. As existential therapists, we bring ourselves fully into the moment and engage in relationships with our clients as fellow human beings. We share the moment, the space, and the air that we breathe as we connect with our clients and ourselves. There is mutuality in this connection that allows us to be not just a professional, but a living, breathing, sentient being with them. It is in this togetherness that healing occurs. As our clients find their place in the world, in their “herd,” in their lives, we too find ourselves. This interconnectedness allows us to take ownership of the fact that our every action, or inaction, creates a ripple effect for those around us. Much like the horses in the herd, we cannot help but to make an impact on each other. So, what’s in it for me in doing this work is the same as what’s in it for the horses: connection, relationship, and knowing that our existence matters.